The original Aryadeva (Tib. 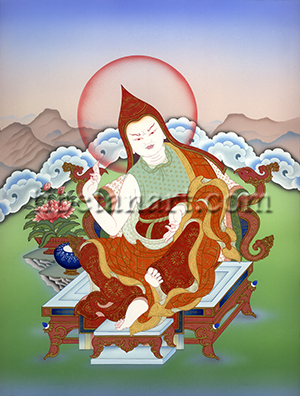 Pakpa Lha), meaning the ‘Sublime Divinity’, was a disciple of the renowned Buddhist philosopher Nagarjuna. Aryadeva is recognized as one of the ‘Six Ornaments’ or early commentators on the Buddha’s teachings, who along with Nagarjuna continued to consolidate the Madhyamikya tradition. Aryadeva was born in Sri Lanka in the 3rd century and his most important written work was the Catuhsataka or ‘Four Hundred Verses’ revealing how the philosophical insights of madhyamika should be actively employed. The ‘second’ and later Aryadeva was the Mahasiddha Aryadeva, who was also a disciple of the ‘second’ Mahasiddha Nagarjuna, who both lived during the 8th and 9th centuries. The Mahasiddha Aryadeva is also known as Karnaripa, meaning the ‘One Eyed’, and was likewise born in Sri Lanka and would later travel to South India to find his mahasiddha guru Nagarjuna. Having been miraculously ‘lotus-born’ within an immaculate lotus blossom, Aryadeva entered India’s famous Nalanda University at an early age and eventually became the Abbot of its thousand monks and scholars.